This project started out as a little challenge to myself. My husband's grandmother was an avid quilter. 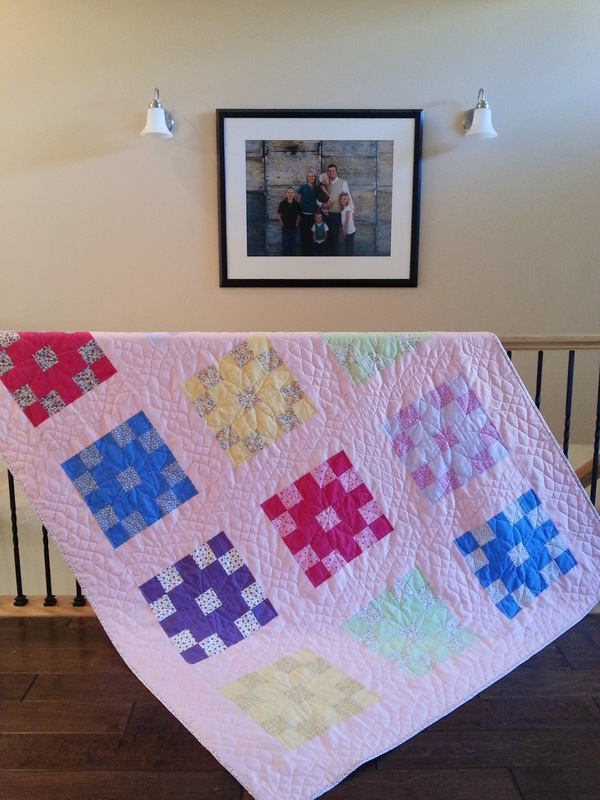 She made many, many quilts over the years. So many that when I asked my mother in law if she could pick a number, she said "hundreds." My MIL has a bunch of her quilts that are now well-worn family heirlooms. Some are still on beds living out their days keeping visitors warm. These are the fabrics I started with. Just some 30's repros I picked up here and there. I wanted them to have the same feel as Grandma's original so I purposely picked non-matchy-matchy prints. Besides, I'm not much the matchy-matchy type. Grandma's original has this same pink background color along with all the bright solids. As you can see she was a woman who was not afraid of color! I know it's super granny-traditional but it's still very sweet to me. And it came out looking exactly like hers. Since it's a vintage knock-off I thought it deserved a real vintage back. The pink stripe is a sheet I picked up thrifting many moons ago. Thrifted sheets = Instantly soft quilts! With this quilt I've also accomplished another goal of mine from this year, which is to make more quilts with non-white backgrounds. Check! I'm pretty sure my youngest will lay claim to this quilt in one way or another since it is pink. I'm thinking with the other 2 quilts she's already claimed I'm going to have to find a way to start displaying them in her room somehow. Finished size 60" by 78"
what a sweet tribute to your grandmother! I love quilts that have a vintage look. Great thrift store find for the backing! Beautiful quilt. I love the pink background. It really makes this a nice cheery quilt. Lovely tribute to your grandmother. Beautiful job! 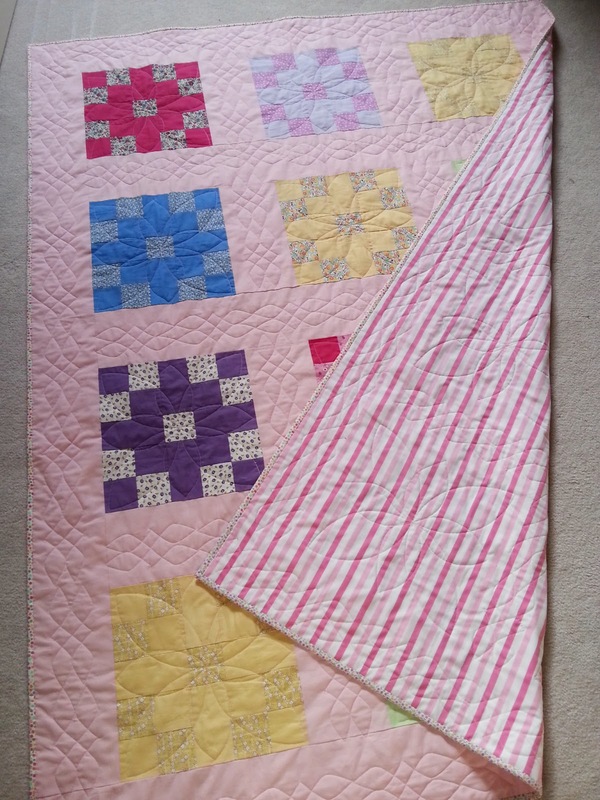 I have a half dozen of my Granny's quilts, and I've never thought to recreate any of them. What a great idea and learning experience!